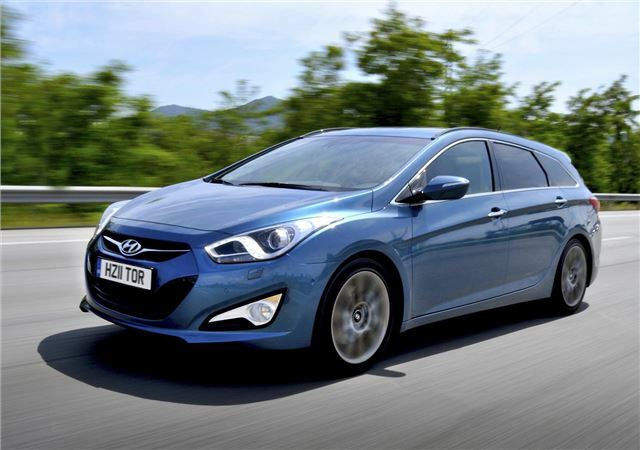 Hyundai has released pricing and specifications for the i40 Tourer, starting at £18,395 for the 1.6 GDi Blue Drive in Active trim, rising to £25,895 for the 1.7 CRDi automatic in Premium trim. Standard equipment is generous, with Active models featuring 16-inch alloy wheels, Bluetooth connectivity, USB- and Aux-in leather steering wheel with inbuilt audio controls, heated electric door mirrors and an electronic parking brake with auto hill-hold. Style models, priced from £20,195, add touch screen sat-nav, a reversing camera, cruise control and dual-zone climate control. Top of the range Premium models are priced from £23,795 and feature full leather upholstery, panoramic glass roof, and keyless entry. Additional options include Smart Parking Assist, heated leather steering wheel and ventilated front seats. The 115PS 1.7 CRDi Blue Drive in Active trim has the lowest CO2 emissions in the range, at 113g/km, placing it in VED band C, with a BIK rate of 13% for company car drivers. It’s also the cheapest model to insure, in group 12E, the same as the much smaller Hyundai i10. All models offer the Hyundai Five Year Triple Care package, which covers warranty, roadside assistance and vehicle health checks. A saloon version will be available soon. Full details are embedded below.